This is the first time I've actually made something that fits into the Historical Sew Monthly - it's more of an accident, so I'm still going to do a text post on two lesser-known Regency accessories. But it's an accomplishment I'm proud of! 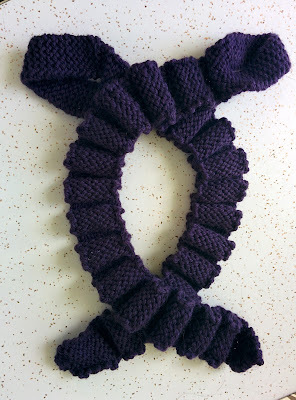 This past weekend was my friend Julie's bridal shower, and for a gift I knitted her a pair of garters. See, Julie's wedding is going to be a masquerade, and the bridal party is going to be in 1870s dress with a dark purple theme - so dark purple Victorian garters would be perfect for her to wear on the day! Plus, my understanding is that bridal showers often have gifts that are a bit naughty, so it seemed like a cute way to refer to that. First worn: Not worn yet!